The Legendary BLACK SABBATH has set “13″ as the title of their new album. This is the group’s first LP with Ozzy since 1978 will be released in June though Vertigo/Universal Republic in the U.S. and Vertigo in all other territories. The drum tracks on the CD were played by RAGE AGAINST THE MACHINE drummer Brad Wilk following original drummer Bill Ward’s decision to not do the reunion. Osbourne, Tony Iommi (guitar) and Geezer Butler (bass) recorded the album primarily in Los Angeles with producer Rick Rubin. Are you ready for the new Black Sabbath album? Are you upset that Ward is not going to do it? Let me know! This is a very solid Death Metal album. It is getting a lot of great reviews from all over the place and this website is no exception! 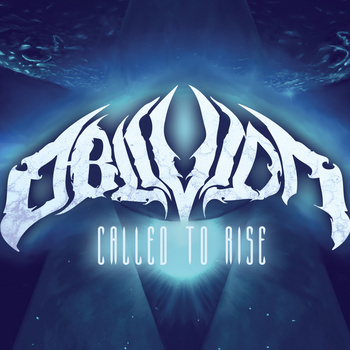 If you like Death Metal or you are trying to listen to some Death Metal music then you need to listen to this album! It will be better and easier if you just watched the video! Review Thrash Sells...But Who's Buying? First off I would like to say that I love how they use Megadeth's title "Peace Sells...But Who's Buying?" and I have to say that I really like this compilation album! 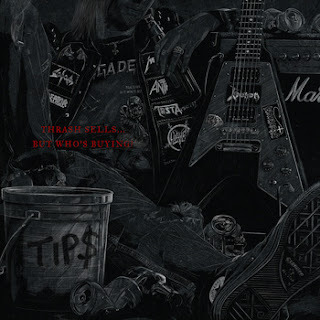 That's right is it a compilation album and it is really worth your time if you are a Thrash Metal fan or not. Track by Track this is a killer album and it just blew me away with the great production, which you don't really get with some Thrash Metal bands today, and each track has it own feeling on it. None of the bands sound the same, which today you have a lot of Thrash Metal bands but most of them so the same. But trust me if you like Thrash Metal then you will like this compilation album, it doesn't have any big name bands on there. But if you don't want to listen to new bands then why listen to music? Anthrax Announces Fill in Guitarist! On January 11th Anthrax that Shadows Fall guitarist Jon Donais will be stepping in after the departure of Rob Caggiano. Jon will be playing with Anthrax for the shows in India, Soundwave Festival in Australia and the Metal Alliance Tour 2013. On the quotes on the Facebook page if feels like they can't wait to play these shows together! So what do you think about Jon Donais playing with Anthrax? Hate, love or don't care? Anthrax is set out on tour and going to perform the whole "Among the Living" album!! Maybe the best Anthrax album of all time!! 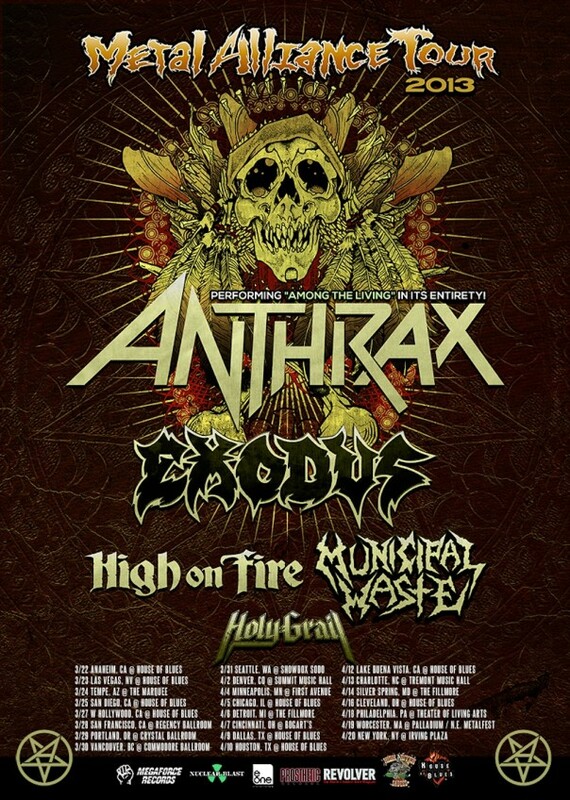 Special guest on the Metal Alliance Tour 2013 include: Exodus, High on Fire, Municpal Waste, and Holy Grail. Are you going to see this Tour? If so what date? I have to say I went into this EP not really expecting that much, but after that I listened to it I don't think I will go into listening an album that way again. It is a really good album. I think it is an album that all metal listeners will enjoy. But for $6 on bandcamp and you get to listen to the whole EP before you buy it, it is really worth your time. This is the my full review of the album! What do you think about the review and what do you think about the album? I was thinking that this we going to be a list of thing but heavy as sh|t metal albums. But this list really showed me that I was wrong. I really like this list. I want to know what you guys think about this list! So what do you think about the list? What are your favorite albums of 2012? Death Angel post 6 new pictures of them in the recording studio for there upcoming album set to release in winter 2013. Maybe soon they will post a "Fly on the Wall" video? Are you ready for the new Death Angel album? I would like to know your answer!! Thanks for reading this "News"
This is my list of the top 20 bands that come out of 2000-2010, If you think that there is something wrong, a band is too high or low, or a band should/should not be on there then let me know. The list is subject to change at any time! Instead of doing what I used to be doing with the news, I have decide to do something different. I am looking forward to do is get underground/unsigned bands to email me news updates that I will post on my webs site. What this does is it makes it easier for my to update my website and helps bands get free promotion. I have a video explaining what you need to do if you are wanting to do this. Just remember subject line is "Metal Band News"
This is a really solid album! I liked every single song on this album. And just look at the album cover!! It just screams :Death Metal" and "Come buy me!" You Death Metalheads need to pick out this album and give it a listen to! Check out the Video!! Below is the video of my review of Hacked to Perfection I hope you guys like it!! This is the FIRST interview we have posted in a very long time I hope that you enjoy it. This interview is with Time to Kill. 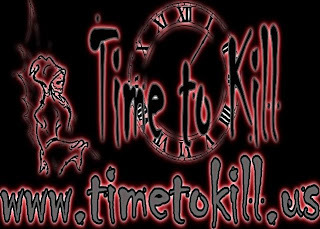 Here is the video of my Interview with Time To Kill. Hope you guys enjoy it!! If the Video does not load then Click on the link below to hear the interview and find links to the band! Let me know what you guys think about the interview!! Here is the video explains what a band needs to do to become the Underground Hot Shot!! If video does not work then click on the link below!! This is my comparison between Iron Maiden and Judas Priest. This has nothing to do with skill just a fun comparison! Video compare number of Gold/Platinum albums, singles, live albums, and greatest hits. Check it out!! Thanks to all you Metalheads!! P.S. I also did a Metal and Megadeth comparison check it out!! Sorry about not having the Video on the website. It wouldn't read the URL. Dave Mustaine calls out CNN telling them to get there facts right. Watch this video for all the details!! If video does not show then copy and paste in the URL box. Metallica Made a lot of Money Touring Last Year! Metallica are a money making machine! In the last few months, we've learned how much both James Hetfield and Lars Ulrich are currently worth, but you know the old saying… it takes money to make money. While the band didn't do much extensive touring in the United States, they did do the European summer festival circuit and, of course, hosted their own festival. Turns out they made some big cash with their limited appearances. Pollstar released their annual list of Top 50 worldwide tours (PDF here) 8th with $86 million in revenue over 30 shows (an average take of over four million dollars a show). beating out artists like Red Hot Chili Peppers, Jennifer Lopez and (thank god) Nickleback as well. In case you're wondering, the top earner of the year was Madonna at $296 million (with an average ticket price of $140) followed by Bruce Springsteen & The East Street Band and Roger Waters. The only other "metal" band on the list is Scorpions at #38 with 32.7 million dollars in touring revenue last year. To be fair, the band does give back. Nearly every band on the Orion festival this summer had great things to say about how they were treated (and to be honest, the press area was the most accommodating I've ever been to). The band are known for being the most gracious of hosts to openers on their tours. Also, a story recently popped up about them creating a scholarship in the name of a fan who was killed while hitchhiking home from one of their concerts. They also donated money to the reward for any information leading to the killer's arrest. They are all class! We have been gone for too long!!!!!!!!!!!!!!!!!!!!!!!!!! It seemed that we feel off the face of the planet but we are back with STRENGTH!! We have an all new YouTube Page!! THIS IS THE NEW AGE OF EVERYTHING HEAVY METAL! I am That Freakin' Metal Guy and this is the new way of doing things!! 1) We will be posting videos on YouTube pretty much every day! 2) We have a new Facebook, Google+ and Twitter page, all of that will be updated! 4) All of our Interviews will be video and any videos posted on here will go to the YouTube Page! More changes are to come!! I hope you guys are as ready as I am for the return on this website!